<Opinion: U.S. gun regulations do not only concern the U.S.
ON MARCH 14th, STUDENTS ACROSS THE NATION GATHERED TO PROTEST GUN LAWS AND TO STAND IN SOLIDARITY WITH THE VICTIMS OF MARJORY STONEMAN DOUGLAS HIGH SCHOOL. Roughly 650 MVHS students, as well as teachers and community members, joined over 3,000 other schools nationwide to walk out of class for the March 14 #Enough Mountain View High School and Community Walkout. According to the student organizers of the walkout, the goal of the walkout was threefold: to showcase solidarity with victims of the Parkland school shooting, advocate for stricter gun laws at the federal level, and encourage students to vote. Two city council members and three students gave speeches, and the League of Women Voters, which “encourages informed and active participation in government”, had a booth where students could pre-register to vote. Student Alex Myers spoke out against what she believes are the failure of our gun laws in America, telling the audience that “on an average day, 96 Americans, 19 of which are under 20, are killed by guns.” She said that while mental health is an issue across the nation, short-term relief can be provided by removing easy access to firearms until a long-term mental health solution is found. Mayor Ken Rosenberg reiterated the importance of student activism and voting. He told students the most effective way to generate change is through talking and writing local and federal lawmakers, and most importantly, voting. Although student Serena Myjer has been shooting guns as a hobby throughout her life in a “controlled and safe environment,” she said she believes that some guns are too dangerous for public sale and that the government must establish what types of guns can be bought and sold. “A line must be drawn between the guns that are designed to kill a large amount of people in a small amount of time and hobby [guns],” Myjer said. A student was suspended yesterday after he took “Make America Great Again” hats from a group of students wearing them and threw them into a patch of mud. The incident occurred in the quad at yesterday’s #Enough Mountain View High School and Community Walkout, where a group of five students gathered peacefully on the outside of the event while sporting the bright red hats commonly associated with President Donald Trump. Among them was junior Luke Olslund, who described the group’s presence as a “protest of the protest.” He said that by wearing the hats, which they planned to do about a week in advance, they intended to represent opposition toward stricter gun regulations. Sophomore Noah Morris and junior Tevanui Freitas, also among the group of hat-wearers, said they attended the walkout to listen to speeches and hear opposing perspectives on gun control, although they believe mental health issues are at the root of gun violence and advocate for different preventative measures. Students at the walkout held signs that advocated for gun control. Photo by Hallie Olson. Olslund, however, said that because the group stood apart from the event, it was difficult to hear the speakers and the speeches did not influence the group. After the speeches ended, Morris and Freitas said they moved with their group toward a more central area in the quad to engage in discussion about the event. Senior Emily Vastano said she saw the students in red hats talking on the grass when senior Andrew Tey approached them, and she watched, “shocked,” as Tey removed one of the hats and placed it in the mud. A small crowd cheered him on, eyewitnesses said, as he proceeded to press the hat into the ground with his feet. As Olslund watched, he worried Tey might approach him next and began putting his hat into his backpack. Tey then returned and, according to Olslund, said, “Why don’t you take that hat out of the backpack.” At that point, Olslund said Freitas approached Tey, and eyewitnesses said a teacher attempted but failed to stop Tey as he removed Freitas’ hat and stomped on it in the mud as he had with the previous one. Freitas then brought Principal David Grissom to where the incident had occurred, he said. After it was over and most students had left the quad to attend fourth period, senior Ella Wiborg said she watched Grissom pick up the muddy hats. As punishment, Tey said he received two days of suspension on grounds that he “caused or attempted to cause damage to private property” and “disrupted school activities,” and was told he must compensate the students for the cost of the hats. Assistant Principal Teri Faught, who was present at the walkout but did not witness the incident, supports the consequences administered to Tey. 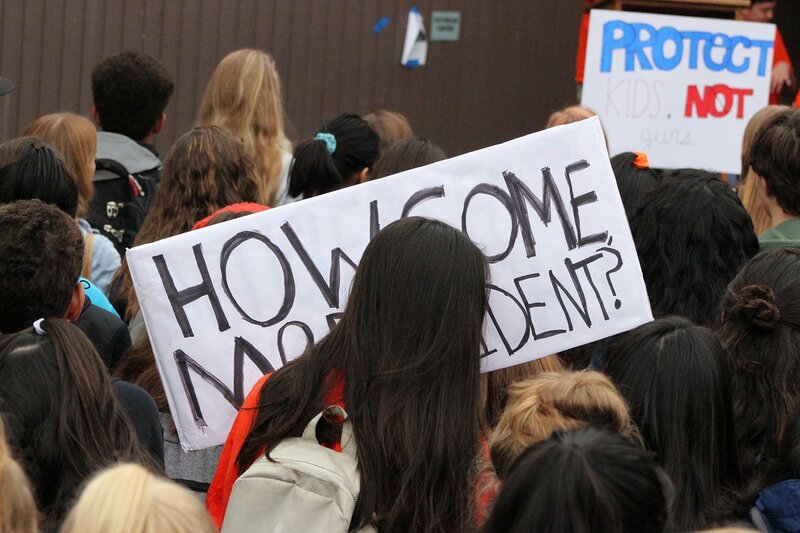 One poster at the walkout read, “How Come, Mr. President?” Photo by Neda Shahiar. Tey chose to target the hats because he “meant no bodily harm to the students.” Those around Freitas were “shocked” when Tey took the hats, he and other eyewitnesses said. Teacher David Campbell did not witness the event but saw the students in the hats standing and talking amongst themselves before Tey had approached them. He said he thought the counter-protest was “a little antagonistic,” but supports the right of the students to express themselves. Others have also argued that Tey’s actions constituted limiting freedom of speech, a stance that Tey is aware of. He holds that he violated only school rules and not the First Amendment’s protection of free speech. Freitas said he has received support regarding the incident from Grissom, Superintendent Jeff Harding, and the teacher who attempted to restrain Tey; he also filed a police report on the event. Vastano felt “disappointed” because she thought the incident went “directly against” those sentiments. Andrew Tey is a member of the Oracle staff but was not involved whatsoever in the reporting of this story other than by submitting a written statement. His views and comments quoted in this article do not reflect those of Oracle’s. Sheli Yaskin also contributed to this article. More than 200 PHS students chose to participate in the National Walkout today, March 14. Students marched to support stricter gun control and remember the 17 victims from the school shooting in Parkland, FL, while others chose to counter protest the walkout. Students marched from PHS to Pioneer Park, where the names of each Parkland victim was read, along with a short description of the student or teacher, followed by a moment of silence. Four choir students sang “Sing Me to Heaven” to honor the 17 lives lost in Parkland and the many others lost to school shootings. Sophomore Sara Sprague proceeded to give a speech, the same speech she will share in Florida this June as part of her speech and debate competition. “My message to Parkland is unconditional love and respect,” Sprague said to the 200 students and community members gathered to listen. “A national walkout is all of us coming together despite our differences, despite our political agendas and uniting to have one common goal and message. That is safety. That is remembrance of Florida. That is making sure something like that never happens again. The reason it is so big and it is national is because when Washington [D.C.] sees that everyone in the country is doing this, they are going to see it is a common goal and this is what democracy is,” Sprague said after the event. Other students chose to attend the walkout to protest stricter gun legislation. “I chose to be here because I think a lot of people have the wrong idea about gun violence. They think if you take them away, violence will disappear. In Detroit, they have strict gun laws, yet they still have high crime rates. Criminals will still find ways, through bombings or illegal weapons,” one senior counter protester said. He believes it is important for students to stand up for their rights and what they believe in. As for change, he does not see a need. “Honestly, at the moment, I do not really see any need for change. However, [maybe invoking] stricter gun laws or stricter background checks but not necessarily stricter gun laws. Take into account the stability of people, rather than just looking at their criminal record and if they do not have one, just checking them off,” he said. PHS students joined hundreds of students across the district and thousands across the nation to remember the Parkland shooting victims and let their voices be heard. After the student speaker, students signed a poster to send to friends and family of the victims in Florida. After the tragedy on Feb. 14, some Marjory Stoneman Douglas High School students and teachers needed a meaningful way to remember this day and those they lost. A peaceful and artistic way they could remember their friends and teachers was to get a tattoo. Students created their own tattoo designs and even designed some for their friends in remembrance of the day to keep their fallen classmates close. Junior Taylor Ferrante-Markham’s tattoo displays the word “Love” in cursive with the letter “L” in the form of a red ribbon. There is also a “17” below the world “Love” to remember the 17 victims. Senior Rebecca Bogart was a student that was directly impacted by the shooting. She along with her classmates were in freshman building in room 1214. After the shooting, she had a tattoo put on the right side of her upper back to remember the individuals lost on that dreadful day. The tattoo is two angel wings with a “17” between them and a halo above the number. The words “Fly High” are displayed above the wings and the date appears “2-14-18” below all of it. These tattoos filled with meaning will continue to serve as a reminder to the survivors to live a courageous and bold life in honor of the 17 victims. To these students, this is not only an act of great magnitude, but also a step of healing for those who survived and have to live with this tragedy. One month after the Marjory Stoneman Douglas High School shooting, the entire Malvern student body participated in a memorial walk and chapel service on March 14 to honor the 17 victims. The silent walk started in the bus lane next to the O’Neill Center. Students followed the Cross in a procession around the ring road in silence, finishing at the Chapel. When students entered the chapel, they saw poster-sized images of each of the 17 victims of the Parkland shooting. During the prayer service, seniors and juniors read short biographiesof each of the victims and placed roses in front of the posters. Head of School Fr. Donald Reilly O.S.A. opened and closed the service with prayerful reflection. Unlike many school walkouts nationwide on this date, Malvern’s memorial was not themed on any political or legislative action around gun violence. According to the National School Walkout website, more than 3,100 walkouts were planned for March 14 at schools nationwide as a protest to push legislative action on gun reform and a memorial to the Parkland victims. Twelfth Grade Academy Leader Mrs. Harriet Lappas and a group of seniors and juniors helped to organize and lead Malvern’s service. “The students chose for the event to be non-political,” Lappas said. An email sent out to faculty, parents, and students announcing the walk explained that that it would be a solemn event in line with the school’s Augustinian values. Senior Louis Margay was one of the students who helped to organize the walk and service. He noted that the walk was not the same as the walkouts that happened at schools across the country. Margay recognized the difference between Malvern’s memorial and other schools’ walkouts, which many Malvern students watched today via social media. “Mrs. Lappas needed help, and I thought it was a good way to pay tribute to victims of this. You can’t please everyone,” he said. Freshman Chris Buysse appreciated the fact that the walk was not politically centered. “I thought it was great because it kind of had a way to please everyone. Nobody could have possibly gotten offended by that because we were respecting the lives of all those who were lost,” Buysse said. Many people agreed that the service was very solemn and respectful to the victims. “It was a really solemn experience and I felt that this brought to light the fact that those were 17 people—something that you really don’t look at with other school shootings. We really looked at them as a figure and we showed that they were people,” sophomore Colin Dougherty said. Senior Drew Brady, who carried the Cross during the procession, agreed. “I think it was good. I think everyone took it really seriously. It was a good time to reflect on the lives of the people in Parkland,” he said. English teacher Mr. John Bohannon was impressed by the outcome of the memorial. “I have told many students that I’ve seen that this was one of Malvern’s finest moments,” he said. In remembrance of the 17 victims of the Marjory Stoneman Douglas shooting, there was a 17 minute walkout, Wednesday. Students took to the stadium to honor the victims while others took to the street to protest and call for change. After the massacre that occurred Feb. 14, the Parkland survivors took to various media outlets to express their exasperation regarding the lack government’s lack of action. They called for stricter gun control and rallied students from all over the country to stand with them. Inspired by the Stoneman Douglas survivors, a local Instagram account spreading the idea of a walkout at Westview soon popped up. “It is important to me that I and the people helping me are able to reach teens in the most effective way possible,” Shira Griffith (11), the creator of the account, said. While the following was small at first, word began to get around after Paige Riza (11) and Mary Lynn Tracy (11) contacted Griffith to become more involved with the cause. In an attempt to start and continue a conversation on school safety, the walkout was meant to confront the issue head on. “[This walkout] is about joining the student body as one to speak up for the fact that schools have become an unsafe place and have it be recognized,” Griffith said. 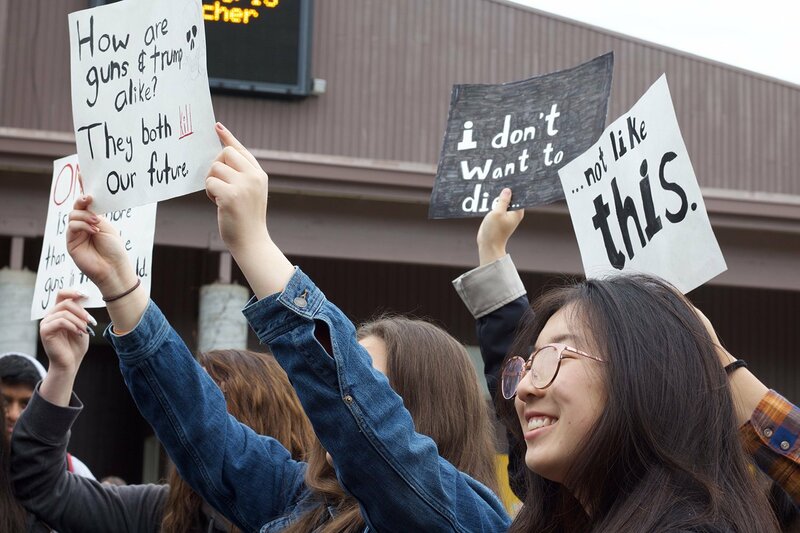 The walkout began to take shape when Griffith, Tracy, and Riza contacted other prominent school figures including the Principal Tina Ziegler and other vocal students hoping to participate, to bolster support. The decision to protest peacefully was done in solidarity with the victims of the shooting, hoping to draw more attention to the issue rather than the protest itself. Though the walkout is only planned for 17 minutes, it is part of a greater movement, one that has even greater implications. Though they say change is necessary, Tracy also adds that important points are often overlooked in the midst of political discussion. In order to grasp the full scope of the issue, according to Tracy, you have to look at more than just statistics and names. Part of the walkout means confronting participants and onlookers with their own desensitization. The walkout and its movement have laid out the groundwork for a more involved youth. It is because of them, according to Tracy, that things are happening differently this time. “The Parkland students have inspired a nationwide movement, and people are finally paying attention,” Tracy said. Though support for the walkout has been evident, criticism and pushback makes the task ahead daunting. As part of the March 14 student walkout, organizers share a message of solidarity and change. Students march onto the football field on March 14. After walking around campus, they met for a moment of silence and released 17 balloons for the victims of Parkland. To stand in solidarity with Parkland and be a part of the national movement that the Parkland students have created, over 300 Tigard High School students walked out of their classes to participate in the national school walkout on March 14. Students first went out of their classes at 9:55 a.m., then met up in the commons and walked out at 10:00 a.m. Students walked through the parking lot, around the tennis court, and then gathered on the football field. Alongside of the perimeter of the walkout, there were a few teachers who supervised if they had a prep period or all their students in their class were walking out. A few Tigard policemen also dotted the perimeter, intended to keep the walkout safe by preventing any outside members from participating. A few students made and brought signs with the national hashtag “#neveragain” and other messages like “rest in power”, “NRA there is blood on your hands”, and “Fear has no place in schools.” Some also wore orange, the color for gun violence prevention. The three hundred students gathered together in the center, while the 12 organizers of the walkout stood the middle, wearing bright orange safety vests. In giant bold letters the message “THS stands with MSDS” was displayed on a big orange banner and proudly displayed by a couple of the organizers. It will be in the commons all week, where students will have the opportunity to sign it and show they stand in solidarity with the students of Marjory Stoneman Douglas High School. The banner will eventually be sent to their high school. Organizer Senior Mayra Favela read off the names of the seventeen people who were killed in the Parkland shooting, while the other students stood in respectful silence. Then seventeen orange balloons were then released into the sky to represent the victims, and the walkout was also seventeen minutes long for the same reason. Freshman Elijah Webster participated in the walkout, and he believes that the walkout brings attention an important problem. “This is a school environment, and I don’t think I should be scared to come to school,” Webster said. Junior Kate Garcia was also another one of the many others that participated in the walkout, and she advocates for having students’ voices heard. “I think if we could do something with an impact and have our voice heard, we should. This walkout is also important in paying tribute to those who passed away,” Garcia said. The organizers also made it clear that this march was just a part of the beginning. If students wanted to take further action, they were encouraged to participate in the March for our Lives on March 24. There was some confusion about the message of the protest. When interviewed on Tigard Today, the spokespeople stated a couple times over that it wasn’t political. Yet, there was an obvious political message during the actual walkout, notably sophomore Meghan Turley advocating for calling and writing legislators and other organizers encouraging students to make change happen. “I do think that Tigard High’s main goal was to stand in solidarity with Parkland and the families of the victims. I also hope that students know that they have the ability to enact change on the issue if it’s something they care about, but what that looks like depends ultimately on them,” Turley said. During the walkout, there were a group of students dressed in black who held their own version of protest, gathered by the steps underneath the flagpole outside of the football field. They didn’t agree with the format of the walkout, as it focused too much on “publicity.” Their intent instead was to respect and pray for the families of the victims in Parkland. They also believed that the message of the walkout was wrong, as they didn’t believe in gun reform. One wore an NRA hat and another wore a “Make America Great Again” hat. Sophomore Owen Wolf was one who stood with them. “We did not protest because we want to respect the families and pray for them,” Wolf said. This march was sponsored by Women’s March Youth, who wants to see a change in gun control legislation. The national message and Parland student’s message is a plea for regulations that will prevent future shootings. The punishments for students varied, although teachers or other staff could not punish more harshly than they would have otherwise for missing class. Administration could also not encourage or discourage students from participating in the walkout. Associate Principal Angelita Miller has a clear understanding of the policy and offers the administration’s perspective on the walkout. “We as administrators or teachers weren’t allowed to encourage the students to go to a walkout but neither were we allowed to discourage students from walking out. This was going to be a student choice,” Miller said. All staff members did have knowledge of the walkout beforehand. The policy was to give a student a tardy if they returned by 10:30 a.m. and an unexcused absence if they returned later. But what teachers actually did varied, with some giving tardies and others not. Students were confused about the punishment as they believed there wouldn’t be any punishments from what the spokespeople on Tigard Today had said. Senior Trevor Rabosky was under the impression that he wasn’t going to obtain a tardy when he walked out and believes that there was too much confusion over what the policy was going to be. “For those who take pride in attendance, it’s going to matter to those students. I personally take a lot of pride in attendance, having only been absent to one class freshman year, and I have never been tardy…For me [a tardy] was a penalty,” Rabosky said. Going forward, the school is working on improving the safety and security so that all everyone can feel safer. A change that has already been implemented is locking side doors to reduce the points of entry in the school. To further prepare students, there is also going to be a lockdown drill during passing time, giving students a better idea of what such a situation might really look like. Administration and the school board also plans to take a look at the Standard Response Protocol, which is the response that the school is trained for emergencies, and see if it needs to be updated. Some students complained that since the administration knew and was allowing it to happen, then it wasn’t a “real” walkout. Nonetheless, student who walked out were still a part of a movement that was much greater than themselves. “Maybe some kids feel like it wasn’t extreme enough, but it definitely was something that we don’t do every day. And they really did pause on their education; they left their classrooms. They were definitely visible to the community and had a gigantic presence in the middle of the football field,” Miller said.